Let’s not fool ourselves. The Deception TV show has been cancelled by ABC after just one season. The mid-season replacement made its debut on March 11, 2018, but even smoke and mirrors couldn’t disguise its lackluster Nielsen ratings performance. 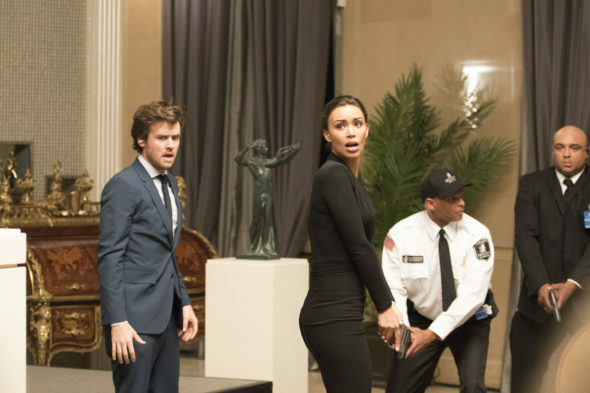 An ABC crime drama from creator Chris Fedak, Deception stars Jack Cutmore-Scott as illusionist Cameron Black, with Ilfenesh Hadera, Lenora Crichlow, Amaury Nolasco, Justin Chon, Laila Robins, and Vinnie Jones. Cameron is rocketing to the top, when scandal derails his show and his twin’s life. Now, this magician uses his tradecraft to help the Feds apprehend some of the most elusive criminals in the world and hopes to prove his brother, Jonathan (Cutmore-Scott), is an innocent man. Jack Cutmore-Scott is an appealing actor. So far though, it seems he hasn’t found just the right vehicle. This is his second series in as many years not to survive past its freshman outing. Fox cancelled his comedy, Cooper Barrett’s Guide to Surviving Life after just one season in 2016. The first season of Deception is averaging a 0.79 rating in the 18-49 demographic and 3.84 million viewers. Find out how Deception stacks up against other ABC TV shows. In total, there were four single-season dramas on the Alphabet’s chopping block today: Marvel’s Inhumans, Kevin (Probably) Saves the World, The Crossing, and Deception. Variety has confirmed the Deception cancellation. What do you think? Did you enjoy season one of the Deception TV series. Should ABC have cancelled or renewed this TV show for season two? My husband and I love this show. It’s entertaining, riveting and intelligent. The cast is brilliant and very engaging. We don’t have many shows we watch together and we are VERY disappointed that it is canceled especially with the suspenseful ending of the season. Perhaps the time slot was a poor choice. We had it recorded on our DVR and just finished watching and we are lamenting the fact that is it. No…I was hooked on this series!!! I loved it!!! Please please please bring it back!!!!! please bring back deception. it was and still is a really nice tv series . it had all the elements of a real movie and i don’t think it was to be cancelled . Shame unto all those who said deception is bad. Please bring back Deception, this was a great show it had all of the requirements like intrigue, suspense, mystery, action even romance was there. I enjoyed this show so much that even having to get up at 4am I chose to stay up to watch it. Please reconsider bringing this back. I don’t think Season 2 should have been canceled. I enjoyed the cast, the scripts, the differences from the typical shows, and I know I had 1 complaint; but since I don’t remember it, it wasn’t worth a cancelation. I would like to know if the Nielson raters differ in TV preferences, regions, etc. not just age; because of some shows that are ranked higher and continue, that I would’ve canceled mid season. I really don’t know how this things work but Deception was very great, i loved every bit of it.